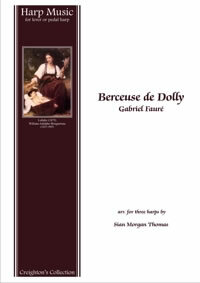 Berceuse de Dolly by Gabriel Fauré will be familiar to many as the signature tune of Listen with Mother. 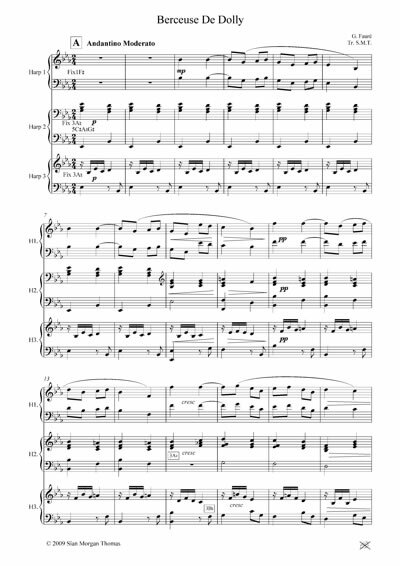 Originally written as a piano duet in 1893 - 96, this popular piece is arranged for lever harps in three parts. Section A (bars 1 - 36) can be played on its own as a short extract or can be extended by making a cut to bar 61 (Section C). Because of the key change at bar 37, the middle section (B) is more challenging. However, with some quick adjustments this section can be played effectively with practice. The choice is yours! The left hand is freed in places to allow for the lever changes. Enharmonics are used to advantage, while occasional harmonics avoid successive accidentals. There are a few deviations from the harmonies in the original score in order to simplify execution and accommodate the intricacies of the lever harp.